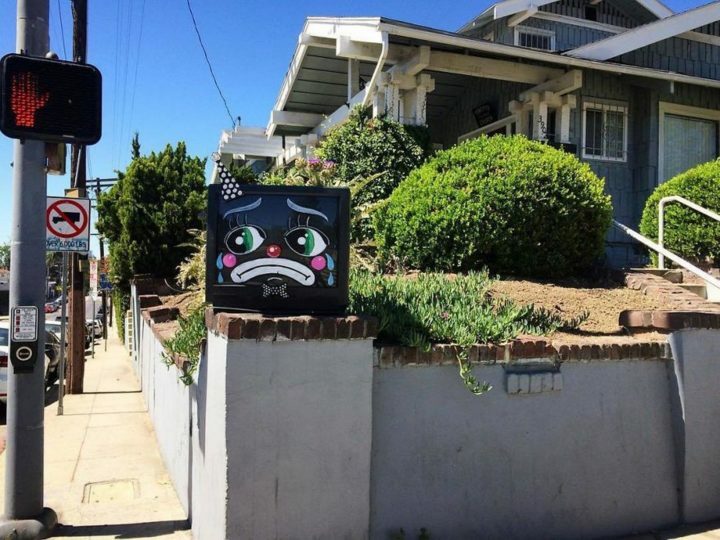 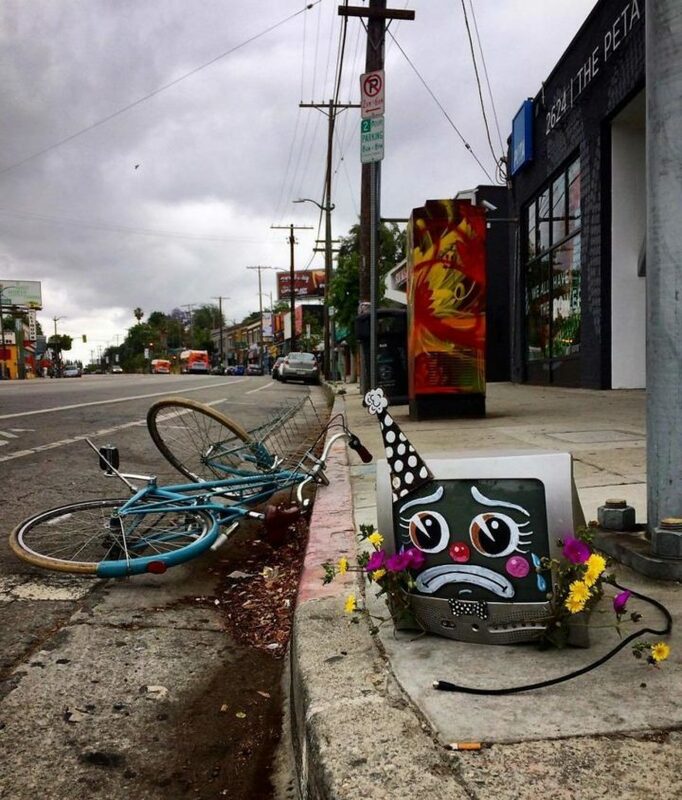 Artist Draws Sad Clown Faces on Thrown Away Objects In Streets of L.A. 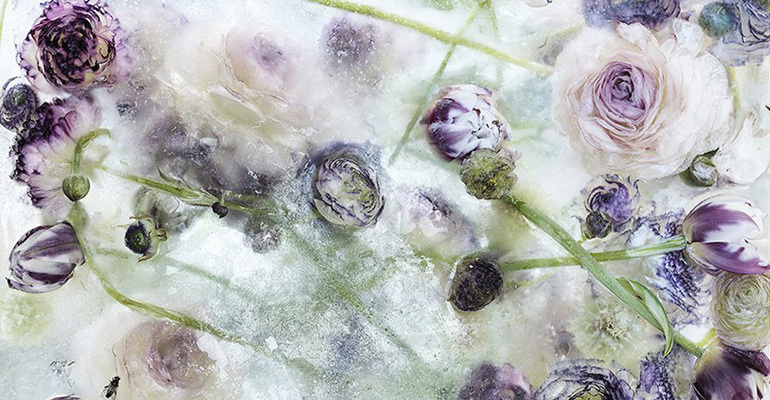 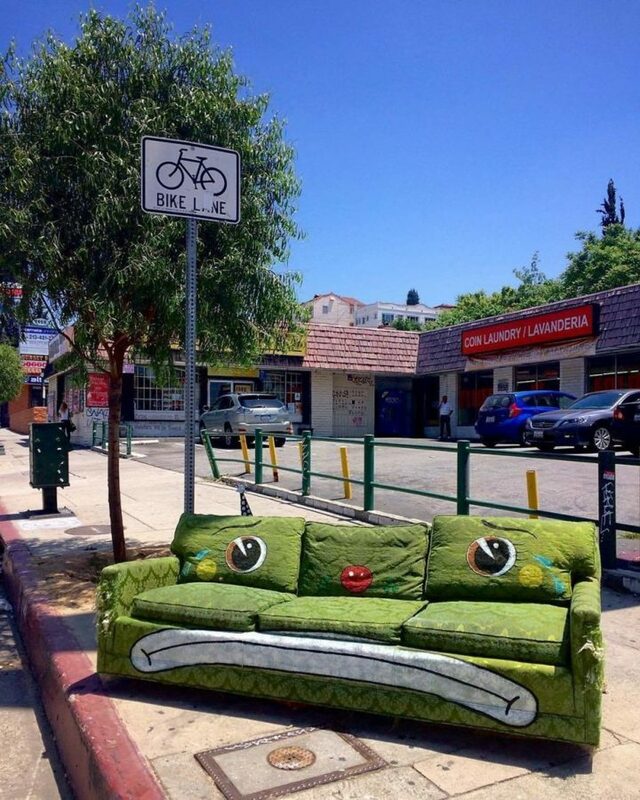 While there are many popular ways of reusing furniture, there are instances where it just can’t be upcycled any longer. 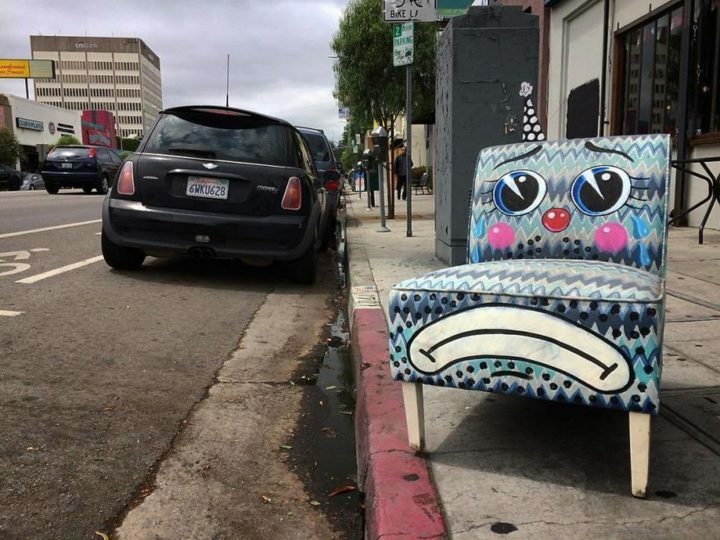 Whether it’s turning old chairs into benches or repurposing baby cribs, there are numerous ways to upcycle good furniture instead of throwing it out. 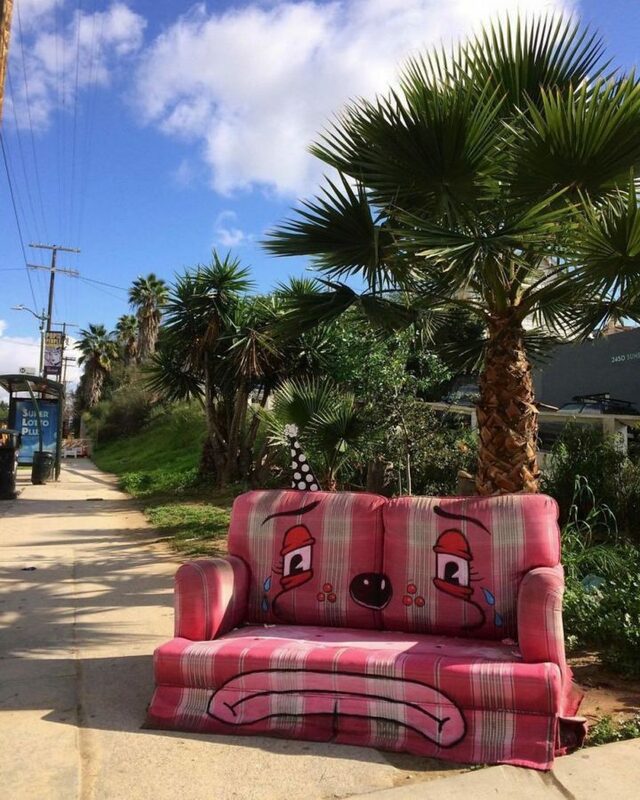 Any unwanted piece of furniture needs to be disposed of at a landfill but many people simply leave it by the curb in hopes that it could be of use to someone else. 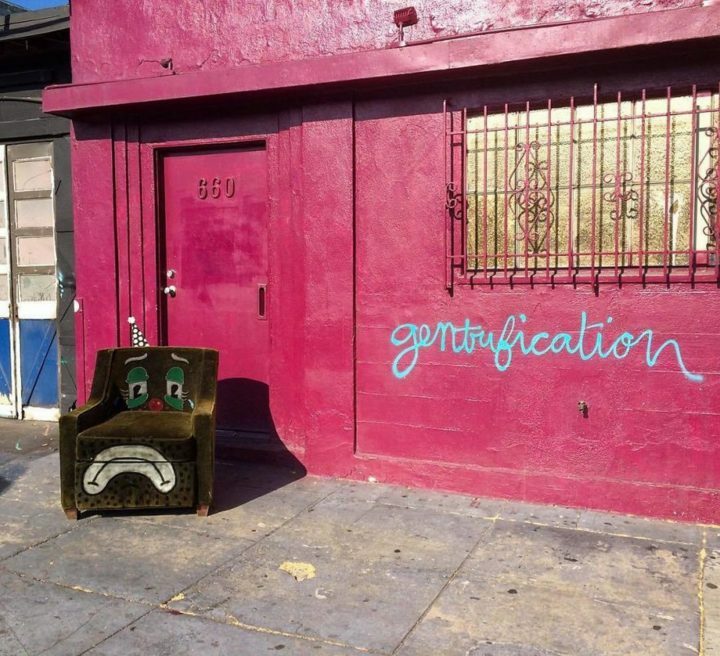 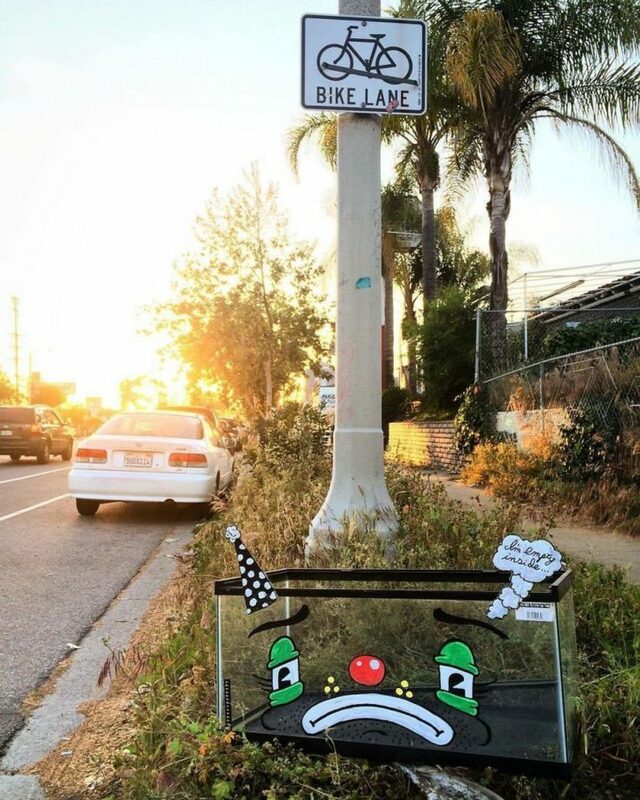 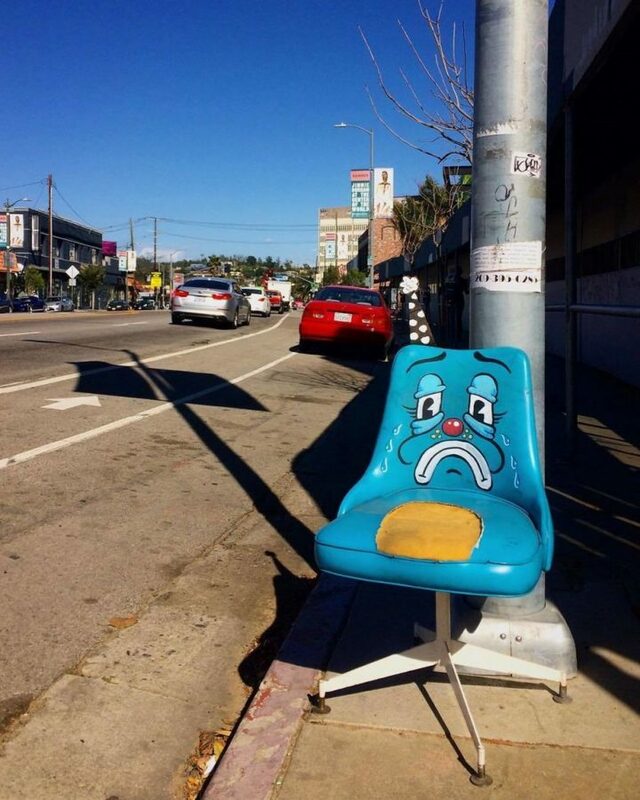 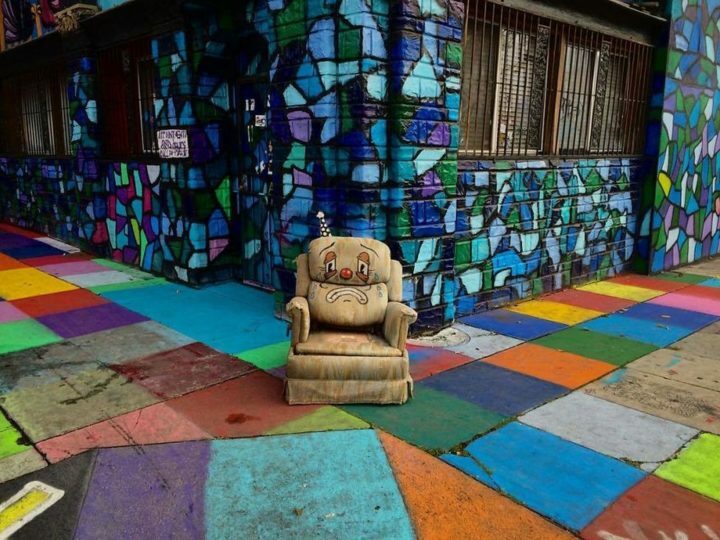 A talented but anonymous street artist by the name of Lonesome Town in Los Angeles cleverly paints sad clown faces on furniture he/she finds. 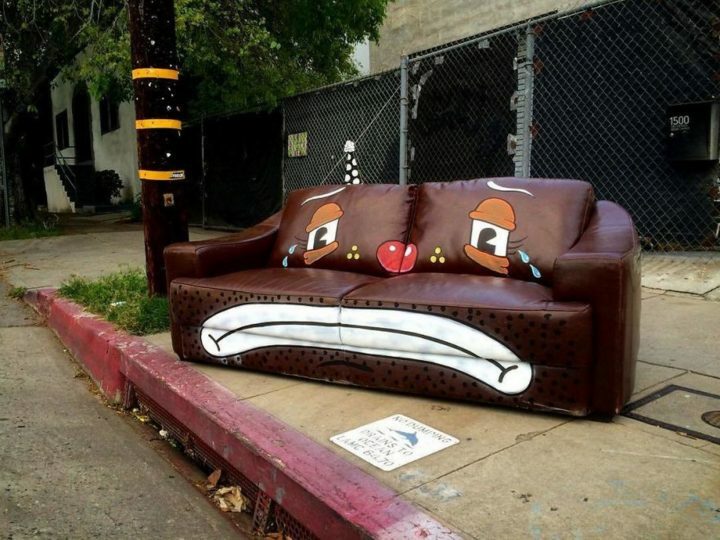 Lonesome Town’s artwork brings a smile to people’s faces and shows just how heartbroken these pieces of furniture really are. 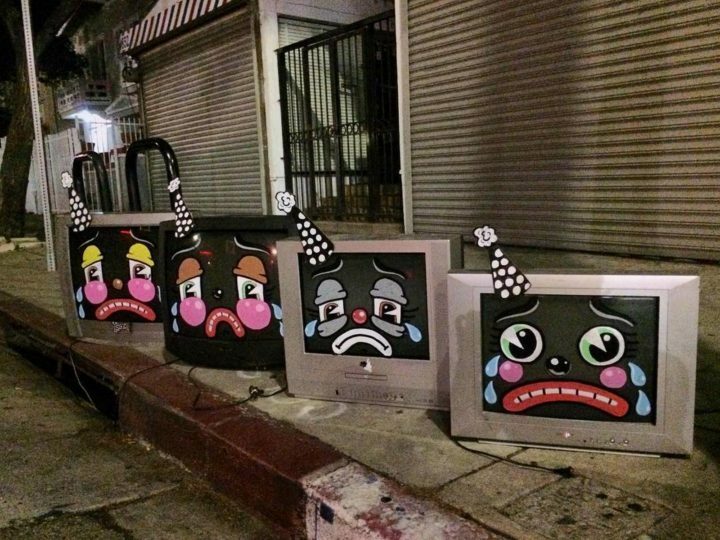 They’ve brought a lot of joy and happiness to their owners over the years but now they’ve been kicked to the curb! 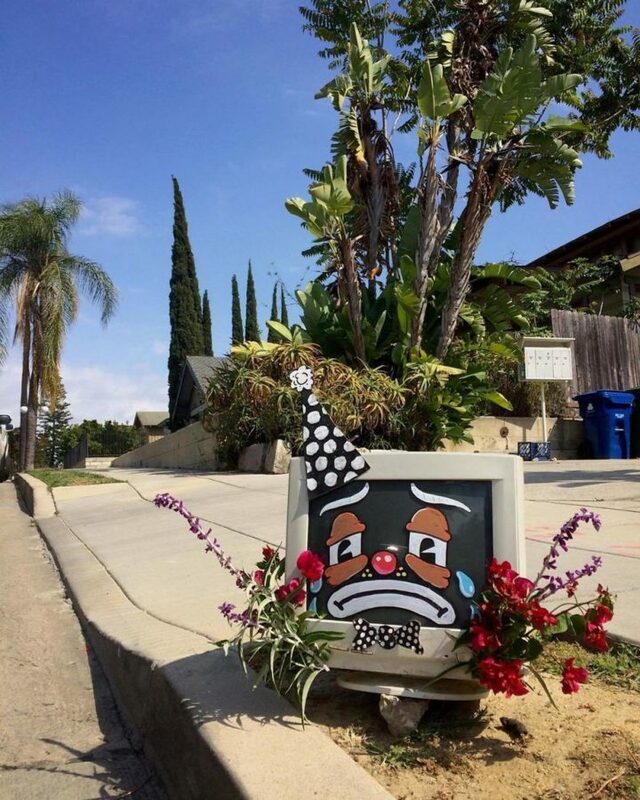 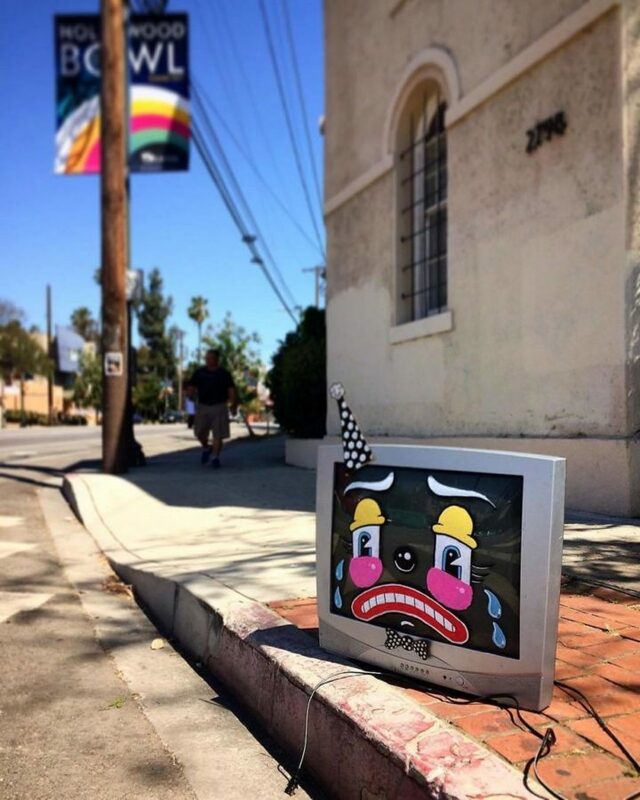 1) Sad TVs with sad clown faces. 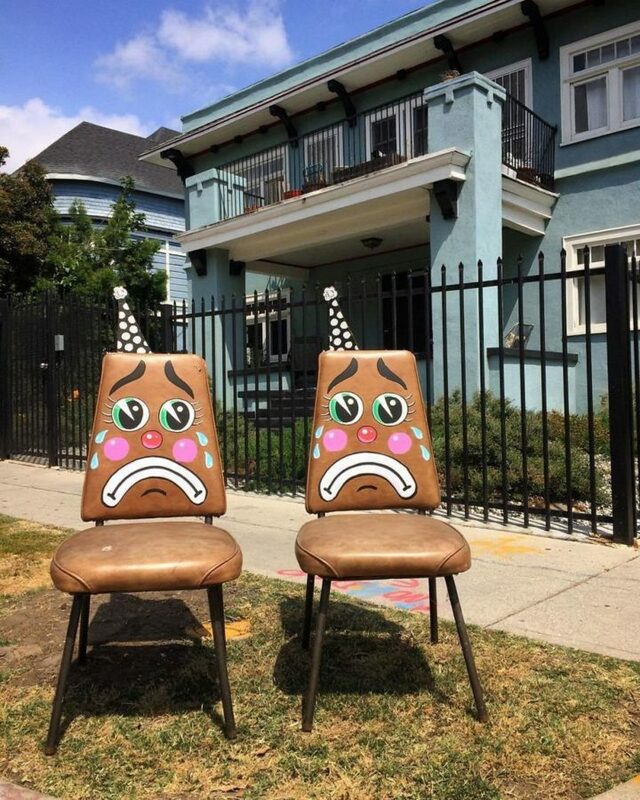 4) Sad twin chairs waiting to be ripped away from one another. 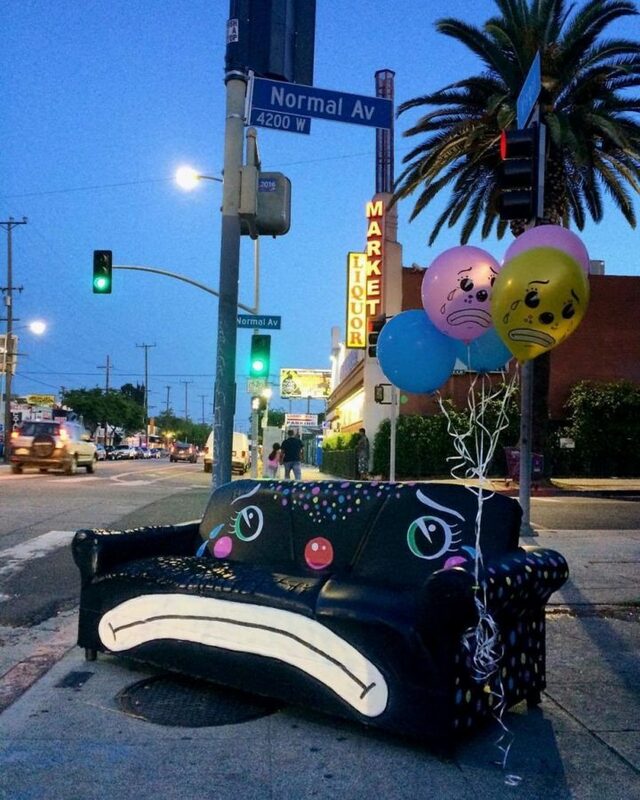 13) Sad couch with sad balloons. 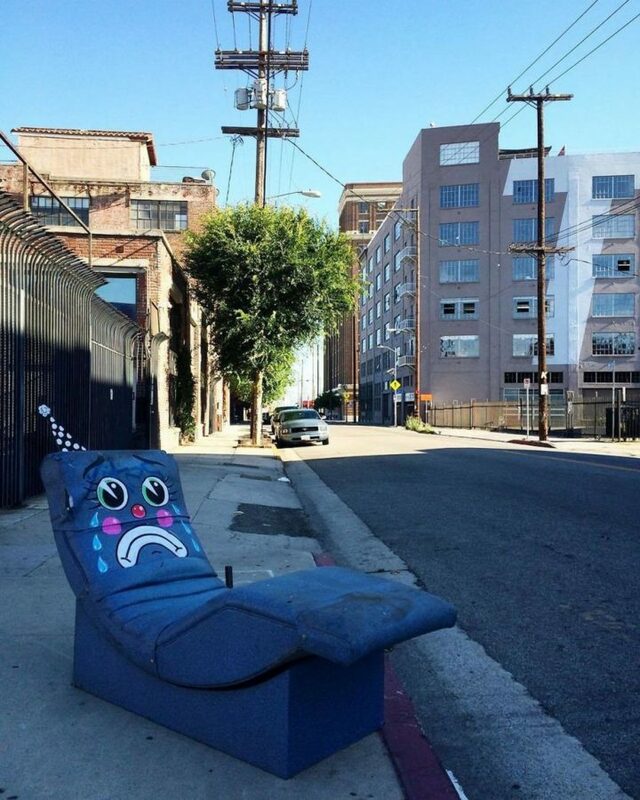 14) Sad child’s chair and ottoman. 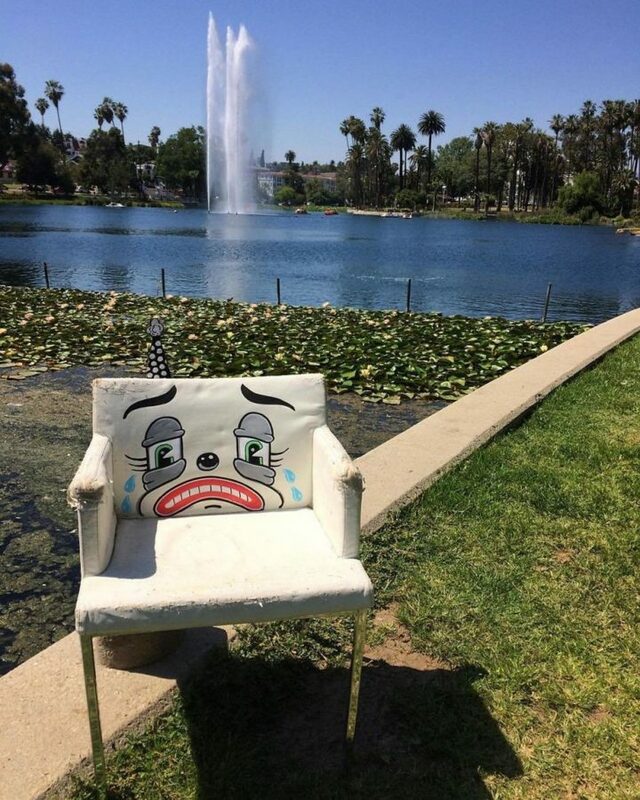 15) Sad chair sitting alone at the park. 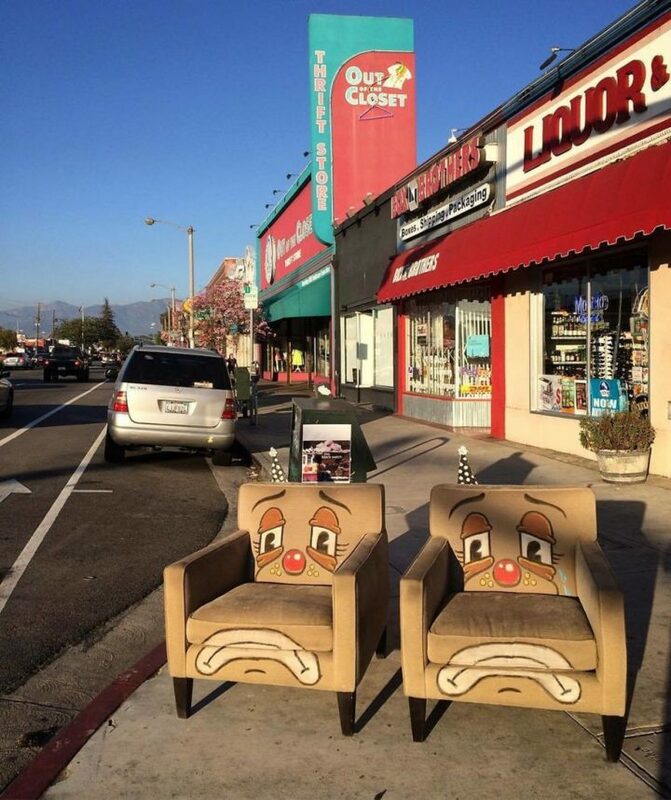 20) Sad twin sofa chairs waiting to be ripped away from one another. 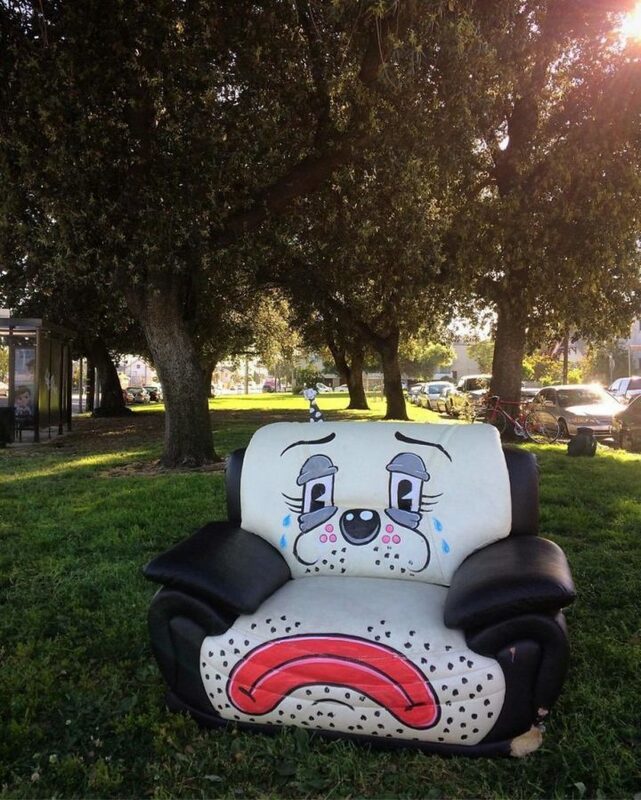 21) This sad chair looks like a big sad panda. 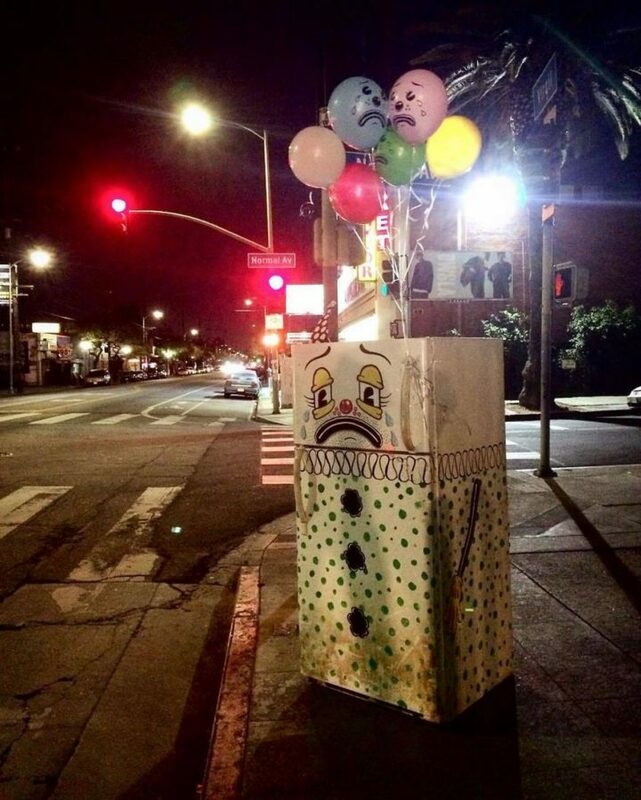 22) Sad aquarium that feels so empty inside. 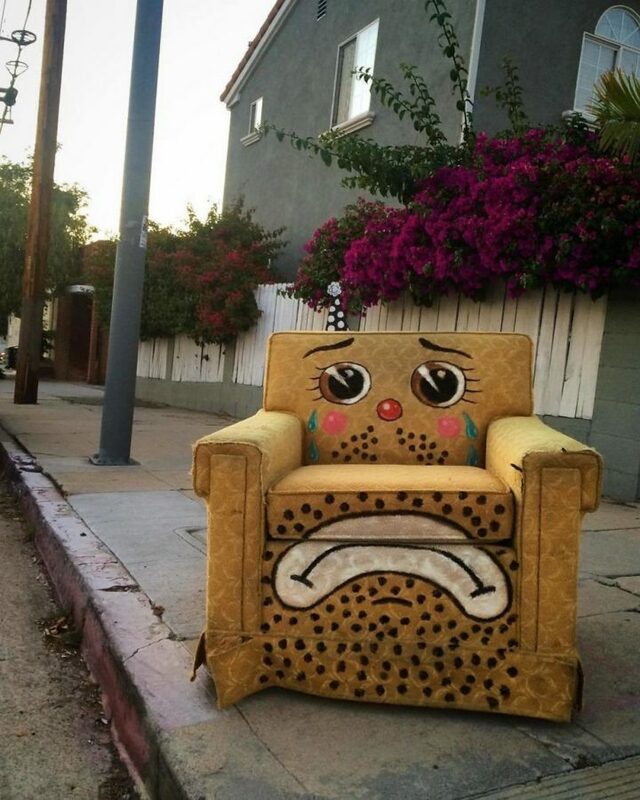 23) Sad chair with yellow hair. 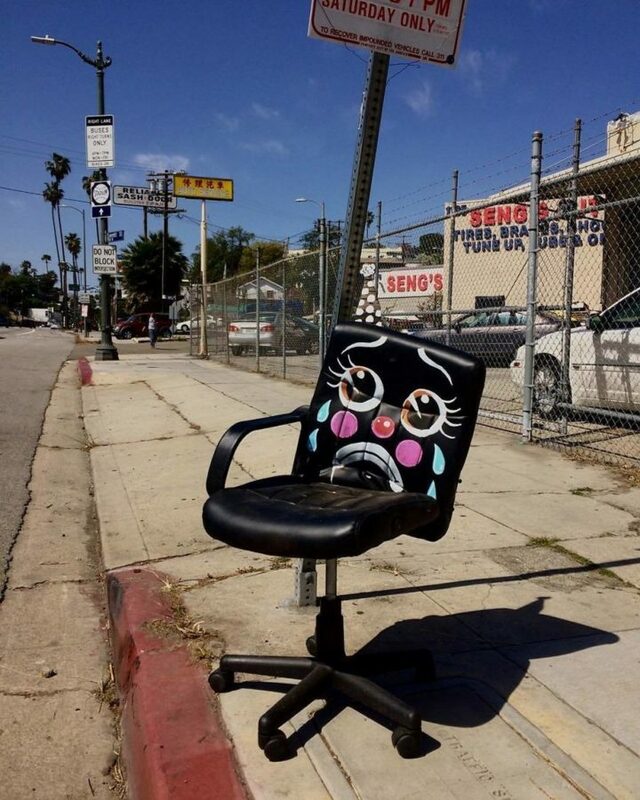 24) Sad broken and unwanted desk chair. 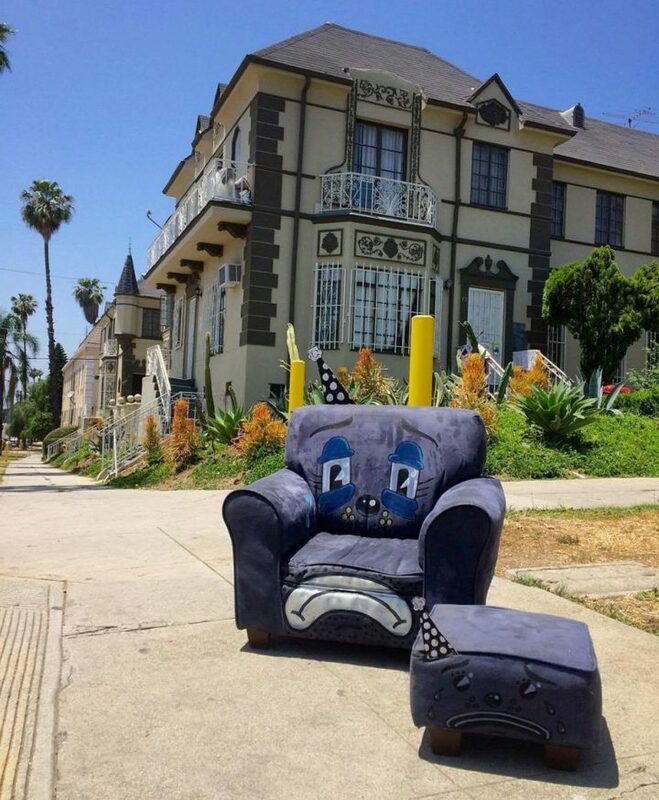 Lonesome Town definitely adds life to old discarded furniture. 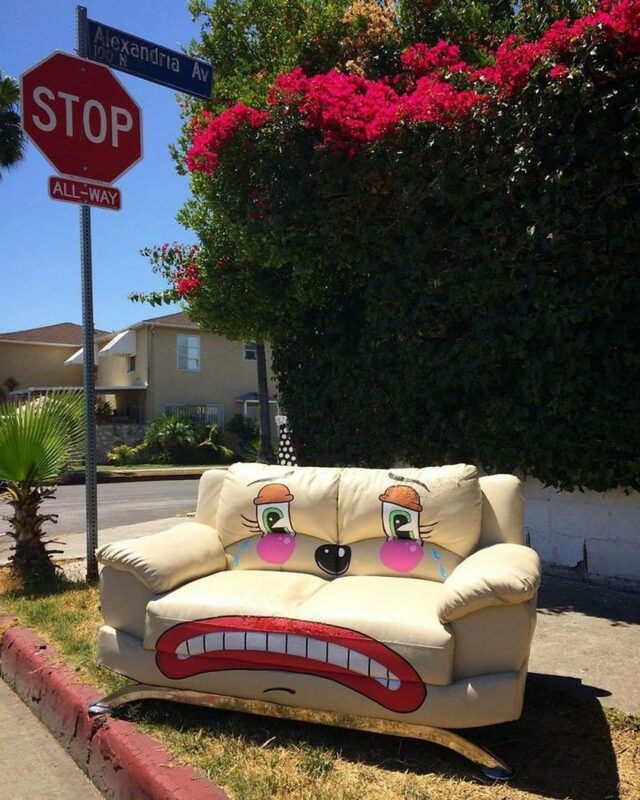 Please visit Lonesome Town’s Instagram account regularly to view sad clown faces they’ve added to furniture and things nobody wants any longer. 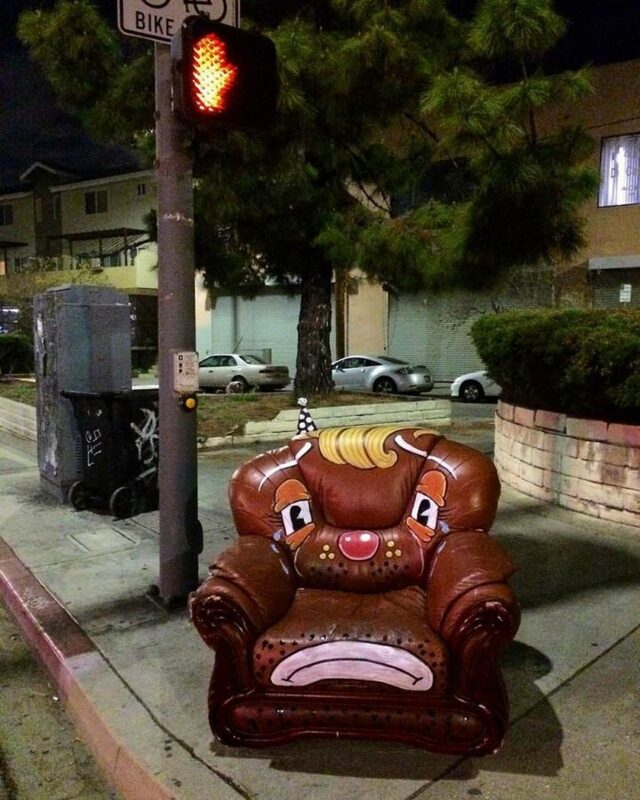 Please share this furniture that has been kicked to the curb and given a sad clown face with your friends and family. 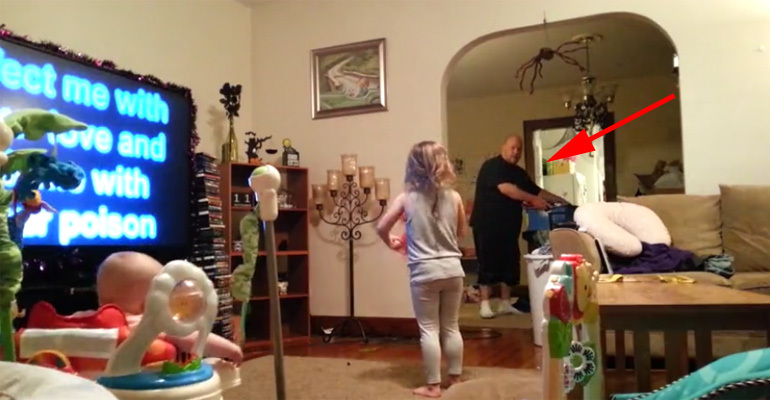 A Public Disturbance Turned out to Be the Best Thing Ever for This Seattle Woman.